Sierra Gold Quilters’ Guild is hosting their biannual Quilt Show on October 6 & 7. 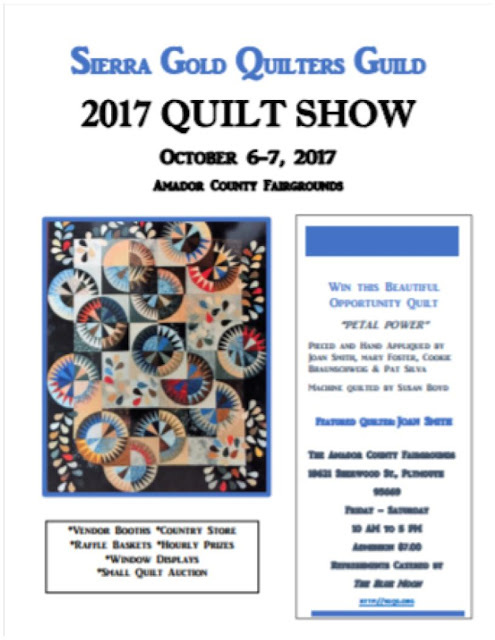 Since the first quilt show in April 1983, it has grown and now includes two buildings at the Amador County Fairgrounds in Plymouth. These quilt shows are the major fundraiser for the Guild. Funds from this and other projects, enable us to contribute quilts and other items to the community. During 2016, approximately 68 quilts, 30 Christmas stockings, 250 dog beds for local vets and dog rescue, 82 clothing protectors, 600 chemotherapy caps, and many toys and school supplies were contributed to various charitable organizations. Organizations that were recipients of these contributions were Operation Care, Amador Pregnancy Center, Hospice of Amador, Bundles of Love, Up Country Angel Christmas Tree Project, Kit Carson Nursing and Convalescent Hospital, STARS, and several other cancer centers in Northern California. Quilting books were also donated to the Amador County Library. Some members of the Guild regularly volunteer at the Amador Arc program, teaching sewing skills to adults with intellectual disabilities. The Guild also has adopted the Interfaith Food Bank and makes monthly donations to that worthy cause. "Petal Power" quilt. Raffle tickets available at the show. As part of the 2017 Quilt Show members have created a stunning “opportunity” quilt to be raffled which generates significant funds. This year’s quilt is entitled “Petal Power” (pictured left) and it features a Kaleidoscope of colored pinwheels and hand-appliqued petals. Raffle tickets are available from members and will be on sale both days of the event; final drawing is at the end of the second day. Our own Joan La Rue Smith will be featured quilt artist for the 2017 show. Quilts have surrounded her life; from the blue/white 9-patch baby quilt, made by her maternal grandmother, to traditional 1930/40's quilts from her family, to her first quilt class in the late 1970's (a "quilt-as-you-go" technique), then to the Philippines in the 1980's, where she finished several of her grandmother's vintage quilt tops and had them hand quilted by a group of Filipino women. Since her 2005 retirement in Amador County, Joan joined Sierra Gold Quilters' Guild and has taken many quilt-making classes. She won blue ribbons at the California State Fair and at the Amador County Fair. 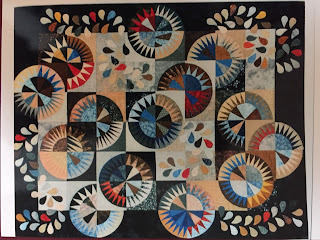 Her quilts have been juried into the Pacific International Quilt Fair in Santa Clara, CA. She had an inspiration for a quilt calendar book, so she designed and made a theme quilt for each month. These quilts will be on display at the quilt show. 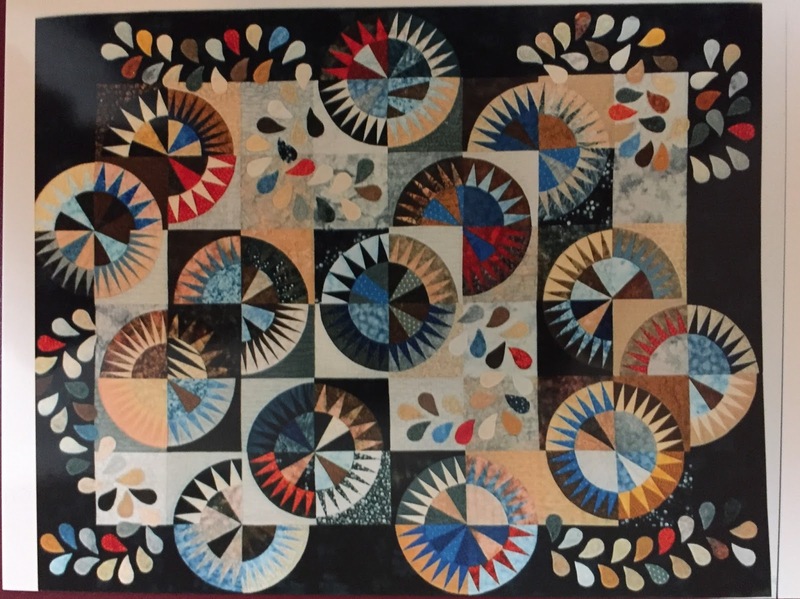 Her recently published "Quilt: A Perpetual Calendar for Birthdays & Other Notable Dates" will be on sale at the quilt show. The 2017 Quilt Show will also include a display of quilts created by our members, a dozen or more vendors selling sewing and quilting items, a country store with bargains galore, raffle baskets of beautiful quilting items, small quilt silent auction, and refreshments will be catered by the Blue Moon. The 2017 Quilt Show conveniently occurs the same weekend as The Big Crush. We hope to see you at our Quilt Show in beautiful Gold Country. Further information may be obtained from our website www.sgqg.org or by calling 209-296-6750 or wittgar@volcano.net.